ROOF CONDITIONER™ is an annual moss & algae treatment that when sprayed on shingles dries to form an invisible barrier that helps block ugly roof stains from returning for up to one year. Zablocki Roofing can provide annual treatments for your roof at a competitive cost. Never look at ugly stains again and give your roof more life. 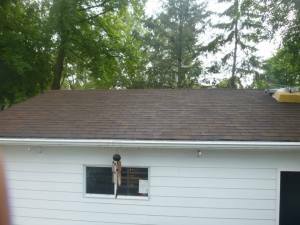 WHY IS MY ROOF STAINED? Most roof stains are caused by the growth of algae, fungus, lichens or moss that feed on the organic material in the shingles. These organisms spread their root systems underneath the granules and if allowed to continue to grow will likely decrease the life span of the roof and cause the attic to super heat raising cooling costs. The portions of a roof that receive the least amount of sunlight are more likely to have roof stains. This explains why some homes may have roof stains only on one side of the roof, typically the northern and/or western exposures or in heavily shaded areas.